Star Trek has a proud and complicated history, including six TV shows and stories in every medium. But to a whole generation of people, it’s just two movies. 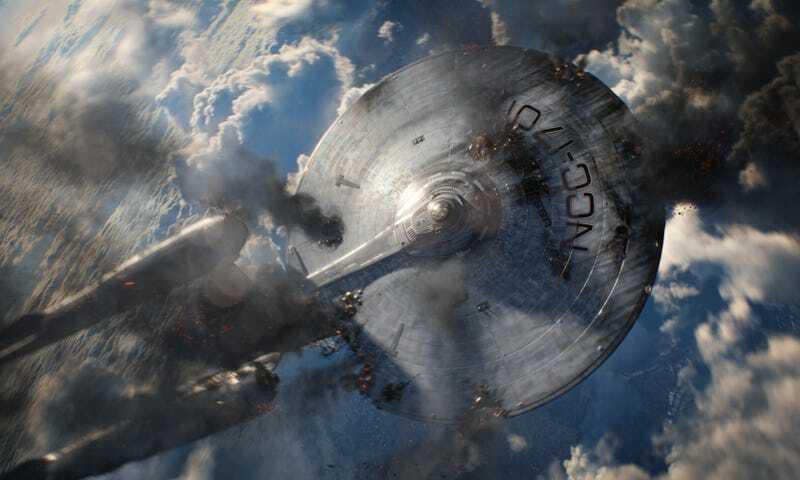 J.J. Abrams’ film reboot reached the biggest audience Star Trek had seen since the 1990s. So if you only know these two films, how do you get into the rest of Trek? This is a slight conundrum. Because on the one hand, if you’ve seen 2009's Star Trek and 2013's Star Trek Into Darkness, then you’re already familiar with the heroes of the 1960s TV show that launched this universe. On the other hand, that 1960s TV show is the farthest from those Abrams films stylistically, in good part because it’s the oldest. Classic Trek is slow-moving, talky, high-minded, and full of old-school television motifs like all the characters looking at the camera and laughing at the end of every episode. So it’s really a question of whether you want to stick to the characters you already know—or start them out on something that’s closer in feel and approach to the two movies you already saw and presumably enjoyed? This is the sort of question that keeps me up at night. So here’s a four-step program for getting into the rest of Star Trek if you’ve never seen anything prior to 2009. This is one of four movies that were made starring the cast of Star Trek: The Next Generation, but it’s the only one that’s watchable if you weren’t already a TNG fan. In fact, First Contact goes out of its way to be accessible to random moviegoers, almost as if they were trying to convert new fans or something. First Contact isn’t really the same as the two Abrams films—it’s actually a fair bit darker and more complicated, but it has certain things in common. There’s time-travel fuckery. The fate of the Earth is at stake. Things get down and dirty. And we explore the history and nature of Starfleet, the organization of peacekeepers and explorers that the Enterprise belongs to. The good thing about First Contact is that it actually gives a pretty good primer about the ideas of Star Trek, including the notion that humans just barely lifted ourselves out of barbarism in the 21st century in time to become part of a community with the Vulcans and other life forms. Once you’ve seen First Contact, you’ll probably be curious about the biggest piece of backstory in the film—how Picard, the captain of the Enterprise-D, got himself captured and assimilated by the Borg, a cybernetic “hive mind” that seeks to absorb and repurpose all other life forms. And luckily, “The Best of Both Worlds, Parts I and II” is one of the all-time best Star Trek episodes, and it’s a thrilling ride in its own right. You don’t really need to see this episode before First Contact, but after seeing the movie, you’ll definitely be left wanting to watch the episode that set it up. At this point, you’re hopefully already hooked on Star Trek. The one-two punch of First Contact’s thrilling action and the thought-provoking storytelling of TNG seasons three and four has probably eaten your brain. And you may even find yourself preferring Captain Picard and his crew of brainy problem-solvers to Kirk, Spock and the other stars of the J.J. Abrams films. I’d start with season two’s “The Doomsday Machine,” which is one of the most straight-up exciting episodes of the series. There’s a giant space weapon, capable of destroying starships, and when the Enterprise shows up, its sister ship has already been trashed. Kirk has to figure out a way to take this monster down, while keeping a Starfleet Commodore from sacrificing the Enterprise. There’s also “Space Seed,” the episode which introduces Khan (remember that maniac played by Benedict Cumberbatch in Star Trek Into Darkness?). And “City on the Edge of Forever,” where Kirk goes back in time and romances a pacifist on the brink of World War II. “Balance of Terror” is another thrilling space-battle story, this time a battle of wits (and wills) against the Romulans. “Mirror, Mirror” sees Kirk visiting an evil alternate universe, which is always fun. Actually, our list of the top 100 Star Trek episodes of all time contains a bunch of total classics—any TOS story in the top 30 is a must-watch for sure. A lot of episodes from TOS seasons one and two are still terrific. And once you’ve seen a smattering of TOS, including “Space Seed,” you’ll get way more out of seeing the best of the TOS movies: the even-numbered ones. Star Trek II sees Kirk dealing with a midlife crisis and the return of Khan, the villain from “Space Seed” (and Into Darkness). Star Trek IV is perhaps the 80s Trek movie that holds up the best today, because it’s a straight-up comedy, about Kirk’s crew visiting 1980s San Francisco. Star Trek VI is nakedly a metaphor for the end of the Cold War, but it still packs a decent punch. So you’ve seen the best of the Original Series and The Next Generation, plus the most decent films. At this point, you’re practically a Trekspert. That leaves three TV shows and a ton of other material still undiscovered. And now, it’s time to go to the deep end. After Deep Space Nine, there are still three TV shows left: Voyager, Enterprise and the Animated Series. But at that point, I’d also recommend diving into the vast universe of Star Trek tie-ins, instead. Authors like Peter David, John Ford, Vonda McIntyre, David Mack, and (io9 reader) Greg Cox have written a ton of brilliant novels and comics in the Star Trek universe, which build on the most brilliant parts of the TV episodes you’ve already watched. There are also a handful of really great Star Trek comics and games out there. But really, once you’ve gotten more than a handful of Star Trek episodes under your belt, you’re already pretty familiar with one of the most optimistic and thoughtful visions of the future ever created. After that, there’s a whole galaxy to explore, and many, many ways to discover it.